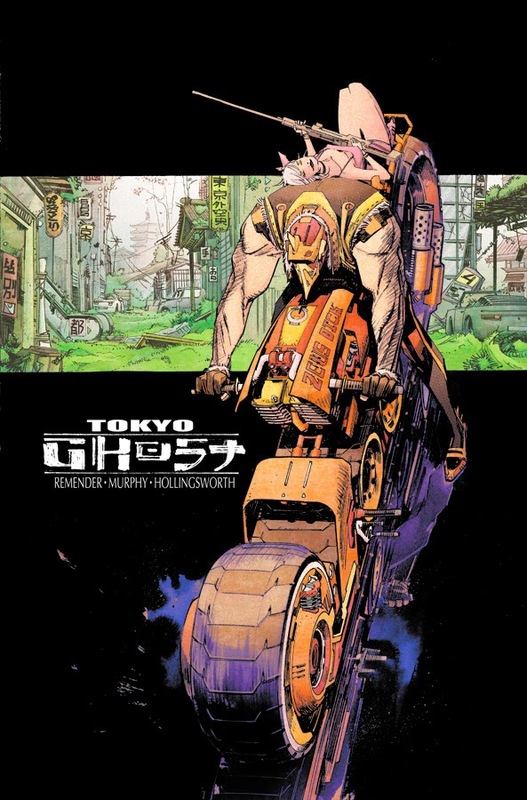 Image Comics hit out with 12 new debuts named at Comic Con this weekend, and while writer Kurt Busiek marked a welcome return to the publisher, with the animal people sorcery tale Tooth & Claw set for November, the big winner of the bunch for my money (or whatever is left of it after doughnuts and pizza) is Tokyo Ghost. This book teams writer Rick Remender with one of the best artists in the whole billuniverse that is the comics industry; Sean Gordon Murphy. He drew fictional universes fantastically in Vertigo Comics' Joe The Barbarian, and given enough creator room, he looks to do it all over again with Image. 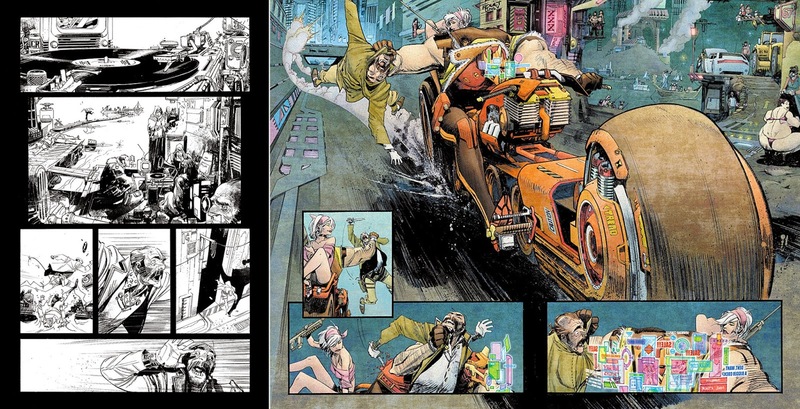 TOKYO GHOST welcomes readers to the isles of New Los Angeles, 2189. Humanity has become nothing more than a sea of consumers, ravenous and starving wolves, sick from toxic contamination, who have to borrow, beg, and steal for the funds to buy, buy, buy their next digital fix. Getting a thrill, a distraction from reality, is the only thing left to live for. Entertainment is the biggest industry, the drug everyone needs, and gangsters run it all. And who do these gangsters turn to when they need the “law” enforced? Led Dent and Debbie Decay, constables of the law, which is a nice way to say “brutal killing machines.” The duo are about to be presented with an assignment that will force them out of the decay of LA and into the mysterious lost nation of Tokyo. If Cops are showing up on your door right now, it's because you didn't click to enlarge those last few examples. Hey consider yourself lucky, last time I had the fuzz show up on my door it was because the neighbours were insisting my bedroom window needed curtains. Fascists. You want to talk about the past. That's where curtains come from! I'm progressive man. Beyond Thunderdome. Ain't no curtains in a Thunderdome. Right Tina? Damn right. I was only wondering just the other day what became of Kurt Busiek - a brill writer in his day. Incredible art in that Ghost book. I haven't seen a city that intrigued me like those backgrounds since Transmetropolitan. I'm definitely picking this up. So Kurt Busiek meets Akira? Thanks guys :) Kurt's been pretty sick lately Karl, and now he's back, his first goal was getting Astro City running again, and now Tooth & Claw will follow. It sounds a lot like Kamandi, minus the last boy on earth, but that's never a bad thing. Seems he tried to write Kirby's original for DC, but the publisher held it aside for Grant Morrison - even when Grant was exclusive at Marvel. How does that work? Me, I think Kurt is money in the bank. Marvels, Avengers and his Superman run back that up. Random - Sean was amazing on Joe The Barbarian. If his work here is the same, you'll forget the book even has words. Sure does Marcelo - glad you liked it!